THE CHARACTERS IN SCOTT NADELSON’S third collection are living in the wake of momentous events– the rupture of relationships, the loss of loved ones, the dissolution of dreams, and yet they find new ways of forging on with their lives, making accommodations that are sometimes delusional, sometimes destructive, sometimes even healthy. In “Oslo,” a thirteen-year-old boy on a trip to Israel with his grandparents grapples with his father’s abandonment and his own rocky coming-of-age. In “The Old Uniform,” a young man left by his fiancée revisits the haunts of his single days, and on a drunken march through nighttime Brooklyn, begins to shed the false selves that have kept him from fully living. And in the title story, a couple testing out the waters of trial separation quickly discover how deeply the fault lines of their marriage run and how desperately they want to hang onto what remains. Mining Nadelson’s familiar territory of Jewish suburban New Jersey, these fearless, funny, and quietly moving stories explore the treacherous crossroads where disappointments meet unfulfilled desire. Critics looking to cast these off as mere domestic stories will find expansive, worldly complications throughout; history, politics, and religion are just three of the Big Ideas swimming laps in these rippling pools… A novel could bring him the attention he deserves, though an artful, accomplished writer like Nadelson ought to be able to sustain a respectable career on stories alone. The former Oregon Book Award Winner’s prose is elegant in its unpretentiousness. The depth of his insight is stunning. The breadth and detail of his knowledge of the ordinary lives of men and women in widely varying walks of life is astonishing. Nadelson is master of the anticlimax… Aftermath is an often-despairing testament to the elusiveness of closure the infinite and insurmountable distance between even intimate lovers, but also to the human capacity for growth. Whether he’s describing a married couple experimenting with trial separation or a young woman dealing with her father’s cancer, Scott Nadelson writes brilliantly about the many forms of ambivalence that love can take. His characters, of all ages, are wonderfully vivid. Aftermath is a sophisticated, emotionally complicated collection with an exhilarating undercurrent of danger. 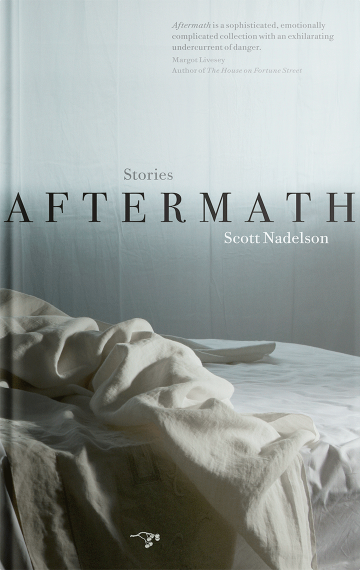 Scott Nadelson’s stories begin with some rupture–a break-up, an accident–and explore the messy results. The relative (and often self-imposed) hell in which Nadelson’s characters find themselves is more than counterbalanced by the heaven of the telling. There’s so much to enjoy in the bluesy aftermath: the deftly drawn characters, the world replete with all-too-normal strangeness, and the sharp-eyed, clever perceptions. I emerged from the book, as if from a movie, so lost in and convinced by the vivid screen, that the world felt a little sunbleached in comparison.